In 1967, Logo was born. Google wants to encourage more kids to learn how to write computer programs. 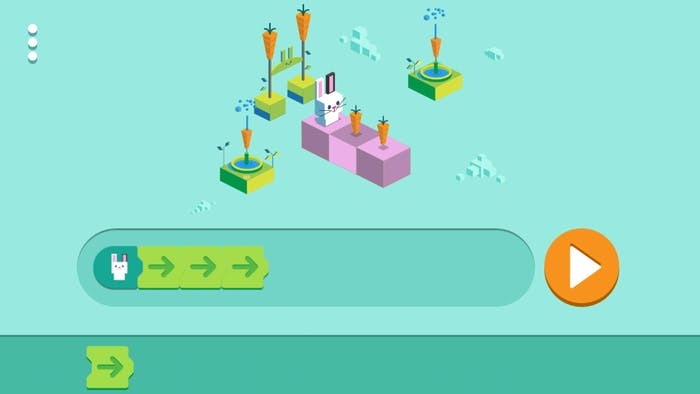 Monday’s “doodle” — a special logo design placed on Google’s homepage — is the first one ever to feature a programmable game. The design is aimed at marking Computer Science Education Week, a global event that encourages classrooms to participate in an hour of coding. It also marks 50 years since the first kid-focused programming languages launched. The doodle allows users to program an animated bunny, using simple block-based commands to list out instructions on how it should move. It starts off simple, with just forward-moving instructions, but then adds more complex options to help the rabbit navigate the maze and munch the carrots. It’s a sign of how far things have come since the early days of computer science learning tools. In 1967, the Logo programming language launched, aimed at teaching kids how to move a triangle “turtle” around to draw lines on a screen. Commands like “FORWARD 40” may have made tough concepts easier to understand, but they weren’t quite as eye-catching as a brightly-colored bunny hopping around. This week, millions of people around the world can and will have their first experience with coding. It makes me happy to think of all of the nine-year-olds who will get their first coding experience playing with today’s Doodle. My hope is that people will find this first experience appealing and engaging, and they’ll be encouraged to go further. In some ways, it’s very different from my first coding experience many years ago, but I hope it will be just as inspiring and influential for them. It’s not the first time Google has gotten experimental with its doodle. Last month, the world’s largest search engine paid tribute to the hole punch with a fun animation of the tool in action.